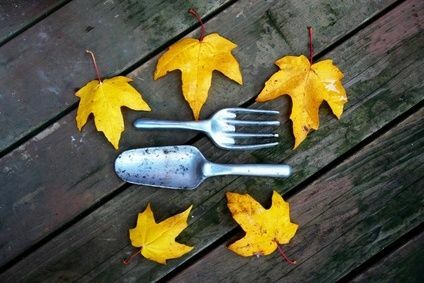 A fall garden gives thanks…till after the dark spell. 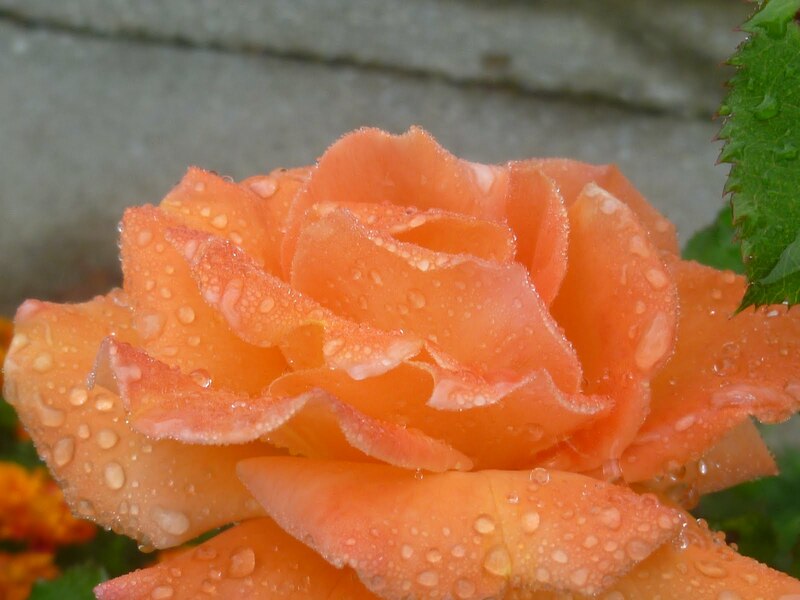 There comes an autumn night when the first dew descends and blesses the petals, leaves, blades and shrub. From the day last spring you gave fresh life to the soil with your nurturing hands, all of these have waited for a fall day to thank you for your touch, the quiet songs you sing as you tend, weed, and do the things to bring life and beauty to this corner lot of town growing old. From a day in early April that first saw life given you…annual volunteers and nursery flats have all known of your love…the love you give and absorb in return from shoot and stem, infant leaves still pale and taut in wait of warmer afternoons. And the feel of joy from bud and blossoms for the touch and tending from knowing hands, still lingers on in September. And just as you had waited for brighter noons and longer days, in quiet anticipation of the unfurling and uncurling of leaf and bloom, now the seasoned plants there can feel one last gratuitous standing ovation for you before slumber and decay coincide with warmer socks, a sweater, and brisker walks for the gardener and her friend. For nearly six months, she has had her regular therapy gleaned from soil and sun, breeze, and fresh air there among the beds and bushes, bulbs and long stems. 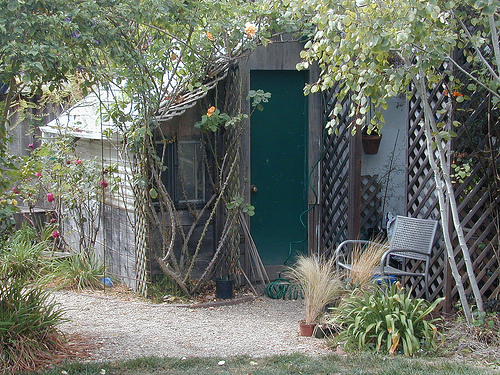 Convening with nature, in solitude among the crowds of flowers and songbirds, dragonflies, honey bees, and ladybugs. 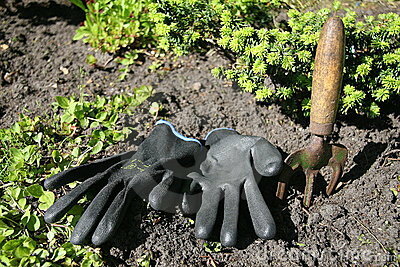 So even out here on her own, the gardener is never truly alone. Life doesn’t end with the hibernation of the gardens in the lot there on Cascade Street, but the earth does rest, collect winter waters, and spent leaves that cascade back to the life giving ground in a layer of thanks. 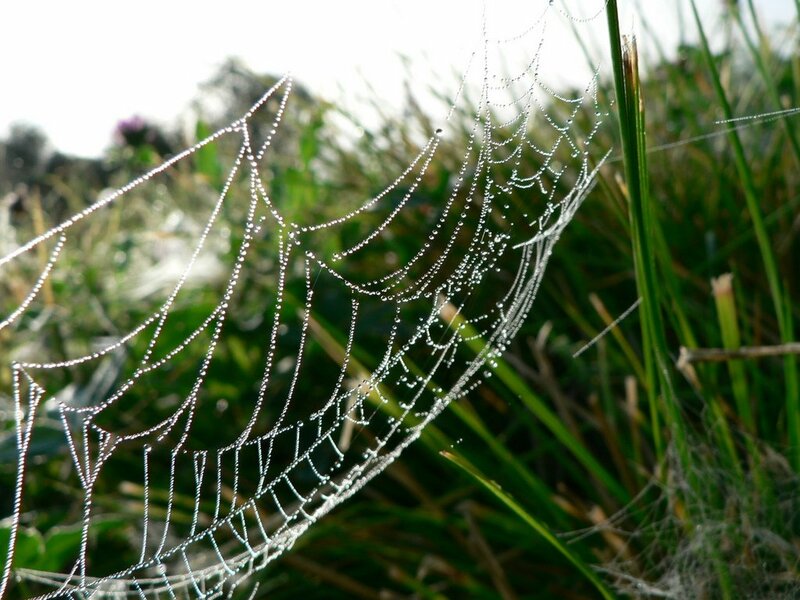 Nature’s artisans…spiders and morning dew. She’s been coming around most nights, a little after dark…and a bit earlier as each day passes…teasing me and taunting me and flashing her cool and beautiful ways. And I’ll leave my window open and allow her to hover softly over my blankets all night until well after dawn. But I know that sadly, she’s here to chase my lady away…to slowly erode her resolve till her plumage is tattered and torn, faded and fallen and lost to the long nights. I admit to be fickle, to loving more than one…to seeing one, then the other…sometimes on the same day. Let’s admit, they tend to be irresistible, and once their mind is made up…exits and debuts are an unerring eventuality. And what one makes up in longevity and warmth, the other overcomes with an unbelievable array of colors and a crisp presentation…As much as there might be a slight rivalry between the two, except for a long moment when one comes a lightly knocking and hanging around after sunset at first. And the other lingers and loiters out of fondness on one hand, and spite on the other…but for a little less time each day…God knows there’s room in this heart for both of them. So far this year, I’ve loved my pair of lovely ladies…and without fail I’ll be smitten again when their distant relation Autumn shows up with her palette and brushes and long cool evenings and soon to be frosty dawns…She sings low to the birds that south will soon be calling them away, and rose petals will tighten and hang on with desperation…and shadows grow longer earlier each day. My friend Ben Vegors and me at his chapel in Walla Walla. 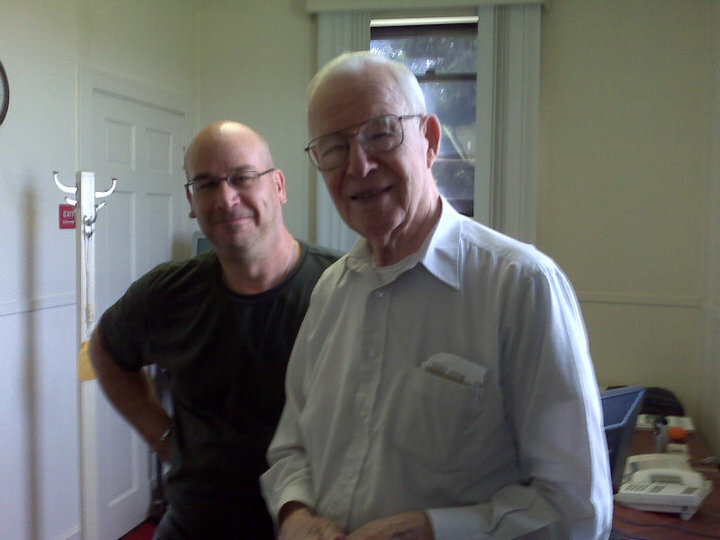 I want to talk about my oldest friend, one of my mentors, and certainly one of my heroes. Chaplain Ben Vegors. Ben is soon to be 90 years old. He still works full time in a vital position at the Walla Walla Veteran’s Affairs facility. He’s the head Chaplain still, after over 50 years. 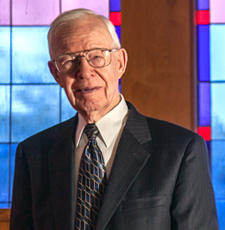 Ben is the oldest full time Chaplain in the United States. He has counseled veterans of every war since the Great War, the war that was fought to end all wars. After serving in WWII, Ben chose to eventually return to service and attend to helping war combatants for the remainder of his life. I met Ben a few short years ago while I was deploying new computers at the Veterans Affairs facility where he serves. We often shared conversations and came to enjoy each other’s company. I had dropped off a couple of my writings for Ben to read, but being as busy as a Chaplain is during times of war, he initially hadn’t gotten around to reviewing them. As I write, I am trying to recall the piece I shared that he initially read. But all I can recall is that during a visit in his office, after he at last read an offering, he looked at me and shared (in essence) that shortly after he began reading, it occurred to him that I was indeed a true writer, that I wasn’t simply well intended, and that I had a gift and a unique perspective to share. Ben dressed for business. A grand and handsome gentleman. After reading a few of my pieces, and sharing many heartfelt discussions, Ben included me as one of his peers, for reasons of merit and shared intentions and abilities. That single act of acceptance and validation from a career minister has changed my life and my self-perception. And it is compelling me to continue to honor my gift, to not only continue writing, but also to pursue publication…and to do my part to better the world with what he deemed my rare perspectives, and my gift of putting them into words. I hope I can see that effort to fruition while he is among us to enjoy the achievement with me. Thank you Ben. I haven’t worked at the V.A. facility for nearly three years, but I still call Ben a day two ahead of time, and travel the sixty miles to take advantage of an opening he pencils into his nearly full schedule. I love the drive, and the renewal of spirit that fills me before and during, and following a visit with Ben. I usually share a writing or perhaps a few. I always have probing questions about world affairs, about my own life or about some souls close to my heart. I am always gladly surprised by his crisp recollections, passionate opinions, and honest and frank answers. My friend Ben is a wealth of incomparable perspective and experiences. I’m not here to write a book about my friend Ben. That would be redundant. I only want to share my perception of my friend, to embellish what I know (just a little), and pay homage to not only a great soul, but a true friend of mine. That is all I need share about me. I intended only to share and qualify the relationship I have with Ben. There are many things from Ben’s substance that make him a special soul, but one the most endearing is his modesty. Even at this advanced age, and in spite of his lifelong dedication to service, to his marriage, his family, to God, and to veterans…Ben is a teacher by example and a healer of souls. Despite these facts, he is of the opinion that folks are making way too much of a fuss over him. He is a humble man. Ben was born in 1922, on September 25th. 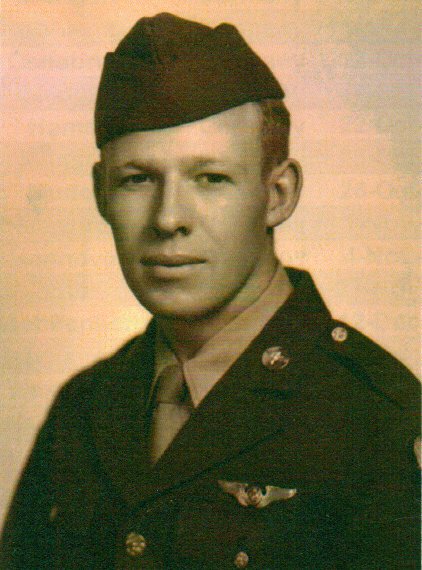 In November of 1942 he joined the Army Air Corp and was assigned in Europe as a tail gunner in the Consolidated B24 Liberator heavy bombers. It was the most prolific of all WWII planes with about 18,400 being built. 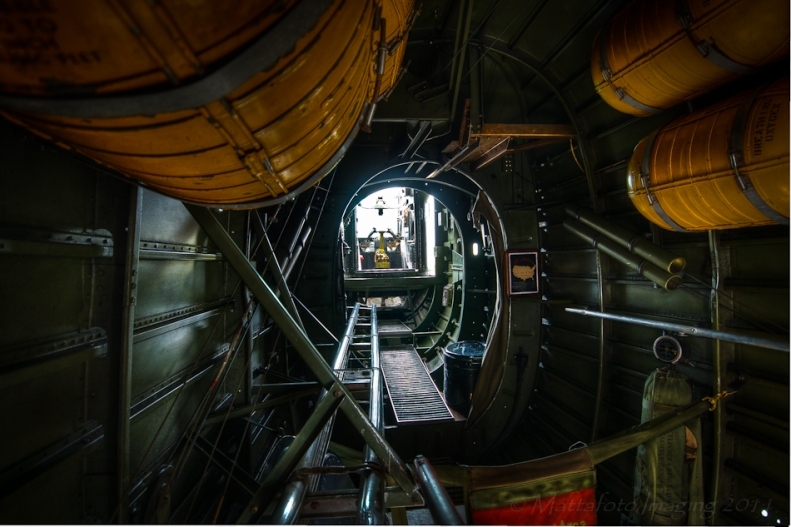 When one enters a WWII B-24 Liberator bomber, there is no ladder, no stairs. The crew entered the plane through either the bomb bay doors, or lifted themselves through an escape hatch in the belly of the plane at the rear. An airman had to literally hold onto the edge of these openings while pulling himself up into it, much like a move by a male gymnast. The tail of a B24…rear escape hatch and tail turret. Ben’s home for thirty long missions. God blessed him and his crews. These planes were instruments of war, tended to by young men comprised of sinew, intense effort, adrenalin, and world saving dedication. Once inside the bomber, an Army airman found zero creature comforts, no amenities or interior paneling to cover all the weapons systems, avionics, mechanical and hydraulics needed to put a flying instrument of destruction into action. I’m going to be frank for a few paragraphs. The lion’s share of WWII war planes were pure hell to occupy and operate. Cabins weren’t pressurized, so all breathing had to happen through oxygen masks. Whatever the temperature outside happened to be, so too was the temperature inside. There was no severe cold weather gear from Gore-Tex, no Northern Outfitters, and no Cabelas. There was wool underwear, leather and sheepskin. It was “we’re doing our best” military issue flying gear. There was “do what you can” for a place “to go”, such as in an ammo can. Twelve hours is a long flight. 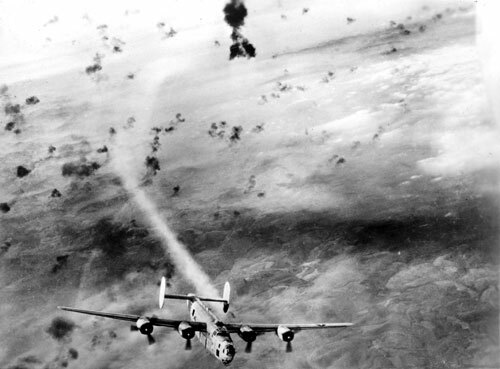 If someone was maimed by flak or gunfire, the resultant splatterings remained in and behind parts and pieces of the cramped and utilitarian bombers. All this primitive existence in a bomber resulted in a foul stench especially when the temperature outside went up. Looking back into Ben’s “office” in the B24 Liberator. The planes were noisy with wind, with engines and propellers, with gunfire and exploding flak, with hydraulics and mechanical operations, and with the dropping of bombs. They were made of metal, and were hard on the bodies of airmen and were strictly a means of delivering bombs. There was nothing glamorous about duty in these planes, and the occupants were generally scared and cold from the second they entered the craft till the moment the plane was safely stopped on the home runway. And a great deal of time, that last part didn’t get to happen. 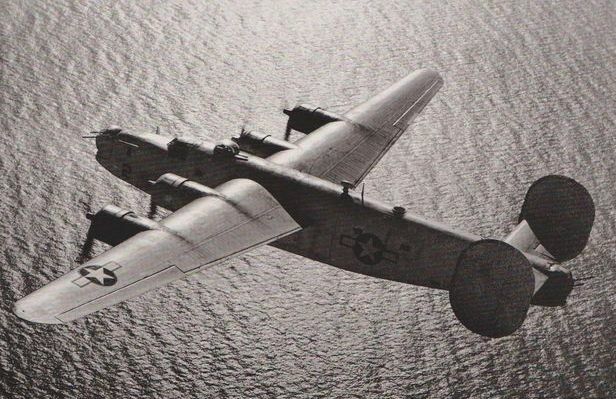 According to my research, over 18,000 B24’s were put into service, and more than 3600 were lost during nearly 227,000 sorties flown between 1942 and 1945. So in fact, fear was justified and it still haunts the men who flew in these planes in any capacity. And the anger towards our enemies still resides to some degree in the hearts of the men who were dragged from their lives at home in the States and anywhere our allies originated. Ben’s place and function in the bomber was in the tail section, a lonely distance away from other crew members. The turret was tiny, even for a man of small stature like Ben. He described the discomfort of being limited so tightly for a half a day in the turret and not even being able to reach back to scratch the back of his own shoulder. Freezing cold, cramped, and scared most of the time. Angry at the reasons one was up there. It was a position in the plane and function of his preference. But his was also one of the most dangerous and vital positions on a WWII bomber. 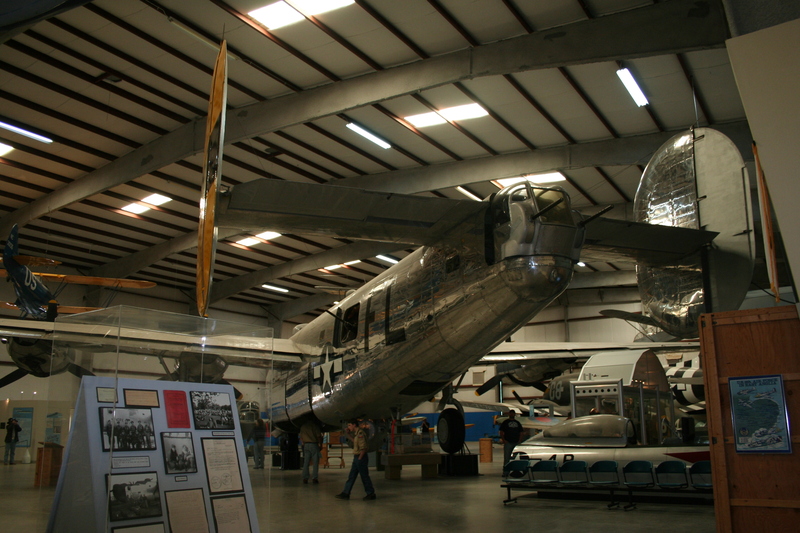 A B24 tail turret in Tucson AZ air museum. 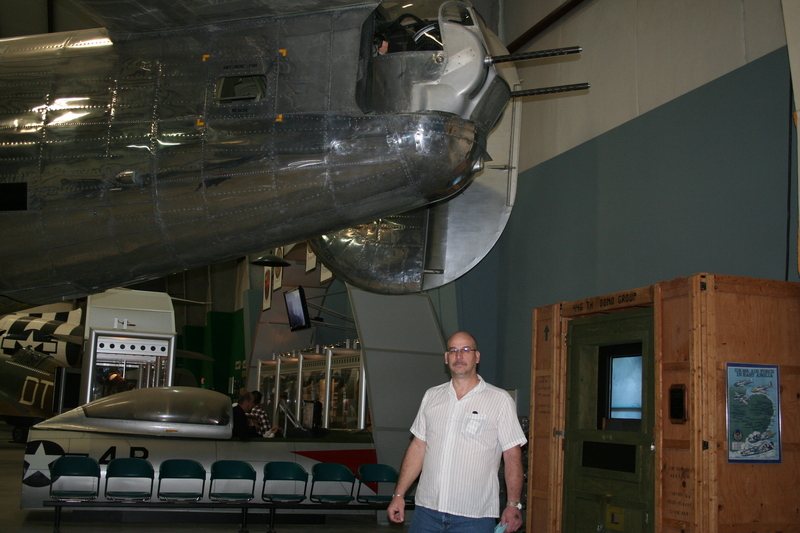 I would not fit into the tail gunner’s position. Cramped quarters. Beginning in late September of 1944, until late April of 1945, Ben hoisted his 22 or so year old frame up and into that inhospitable and perilous place some thirty times. Twenty eight bombing runs into Germany, and two more over Austria. I mentioned to Ben that his was the place for a man with strong faith. A tail gunner had to possess a great confidence in the rest of the crew to the front of the plane. There was to be considered; faith in the navigator to keep a flight on path. Faith in the pilots to deal with the often longer than twelve hour flights. Faith in the bombardier when he took over the flight of the craft near the bombing target till the bombing run was complete, when the bomb load was on the way to the ground target, and a now much lighter plane’s controls were handed back to the pilots. Ben had to have blind faith in the forward crew. He had no forward vision. Only a view to the rear and sides at the inevitable approach of German Messerschmitt Bf 109 fighter planes, that were sent to pick off the heavily bomb burdened B24’s before their loads were dropped on targets and afterward as well. Ben was the last defense of his plane, and two fifty caliber automatic guns had a lot to say regarding approaching flying henchmen and their bad intentions at ending the bombing run’s success and were intent at ending the lives of Ben and his crew. And should the parachute of an enemy fighter pilot have blossomed in Ben’s sights, that enemy pilot would never see another flight or threaten the likes of Ben and his counterparts again. Ben had to have faith that his crew and God would see to it they found their targets and prayed clouds were absent over the intended place. That “bombs away” was accurate and then all the powers in the universe safely managed the newly lighter and more nimble return flight to the home base. And the entire rest of crew had to have faith that God and Ben would protect them from death approaching from the rear. 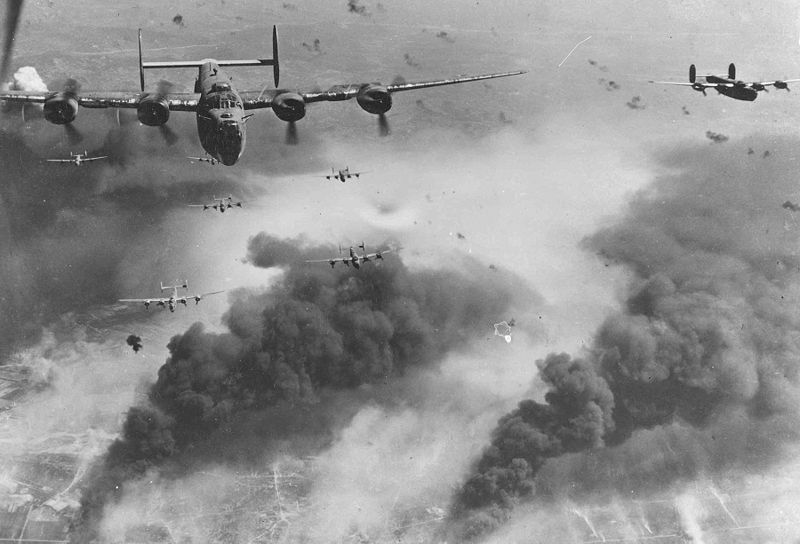 There was a great deal of faith being carried on these heavy bombers, along with fuel, weapons, gun rounds, bombs, and crew. Evidently faith and prayers proved lighter than air on Ben’s flights as all thirty remained aloft and mostly whole long enough to deliver plane and crew to safe landings in the English countryside. And although Ben had no specific religion prior to the war, he did have spiritual beliefs. It is evident that none of the thirty flights Ben was a part of were shot down or otherwise terminated. That is not to say none of them weren’t marred by damage, partially crippled and left in a dire need of divine intervention to prevent a bad end. On three occasions, other crews took planes up that Ben’s crew was originally scheduled to man. And on all three of those flights, luck eluded those men, as they and the planes were to perish. A lot of frightened young combatants surely made promises of future dedication to serving God if they could be snatched from deliverance at heaven’s door when flights went very wrong. And after most of them escaped the worst, they simply passed the promise off as the mortality and urgency of the moment having caught them off guard. My friend Ben was faced with such moments, but one in particular was the most telling and influential…One that lasted for many long minutes, enough to make up near to an hour. Perhaps it was more than an hour. I understand that such moments whether seconds in length, or days in duration, can cause a person to reflect, and influence a man to spend many decades dedicated to making good a promise made to God in the heat of battle. More than once I’ve heard the recollection of one such seemingly doomed flight Ben endured and survived. 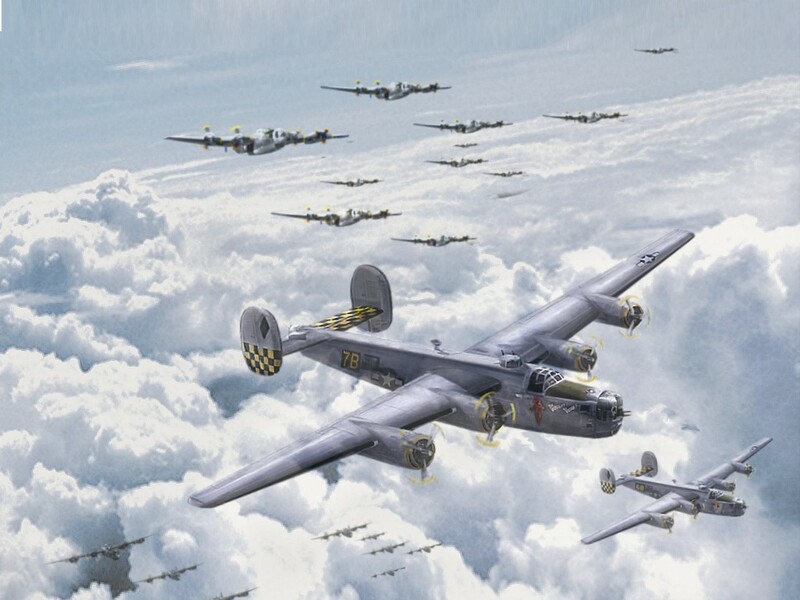 I will never be able to fathom what it would have been like to be in a formation of over a hundred B24’s, nearing a target area while taking tremendous flak fire from many German cannons on the ground guarding the targets chosen by the American Army Air Force to be destroyed that day. Not to forget the Messerschmitt fighters flying nearly twice as fast as the heavy bombers and threatening every one of them. And not unlike the forces today, many of these brave crewmen were in their late teens and early twenties. At home, most would still be a bit wet behind the ears, attending college or working in a mill…Just being young men. On a mission in German skies, that very flak had its way with the two outermost engines on Ben’s plane. 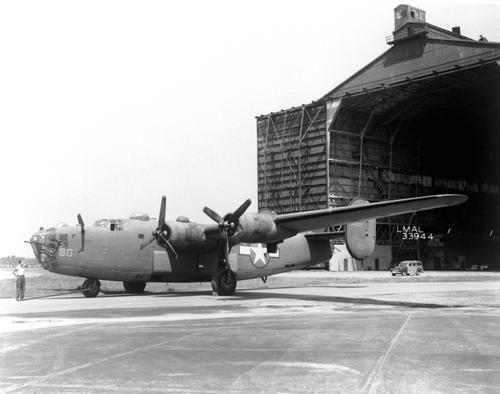 The two inside engines were still operable, but the B24 was handicapped sufficiently that the pilot had to leave the protection of the large bomber group. 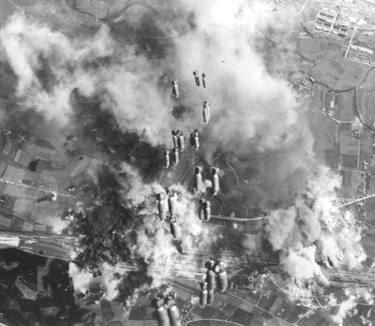 A bad day in the skies of Germany…hit by flak. With a feeling of resignation to either perish or live to become POW’s in a German camp, the plane and crew were forced to separate from their friends there in the sky. They lost the heavenly protective group along with altitude. At this point on a normal faltered and wayward flight, the Messerschmitt Bf 109’s would close in and mercilessly kill the floundering plane. There was no doubt during those fateful long moments, in that cold, noisy, stinking, shaking and shuddering, albatross of a plane, that minutes ago had been a bird of prey…a crew of terrified and justifiably, there were some freshly religious and praying young men. Ben would have been somewhat isolated from whatever lay in front of the plane, not privy to the view the rest of crew was likely seeing…And so I imagine he prayed, and huddled down even tighter in his would be coffin…and I imagine he talked to the man upstairs, about seeing the sunrise, about touching the face of his future bride and imagined their unborn children. He may not have put it into so many eloquent words, but he did in fact make a deal to be at the beckon call to God for the long run…if wheels touched friendly ground and a free and healthy future was still in the plan. Ben made a midair dedication to serve God, in exchange for a place to land and embrace the broken earth waiting there. It was a promise to be “his” for the duration, plain, honest, and simple. I expect they waited for the German fighters to end them. To use their four automatic machine guns to fire bursts of lead to perforate, aerate, and dismantle that once proud Liberator. 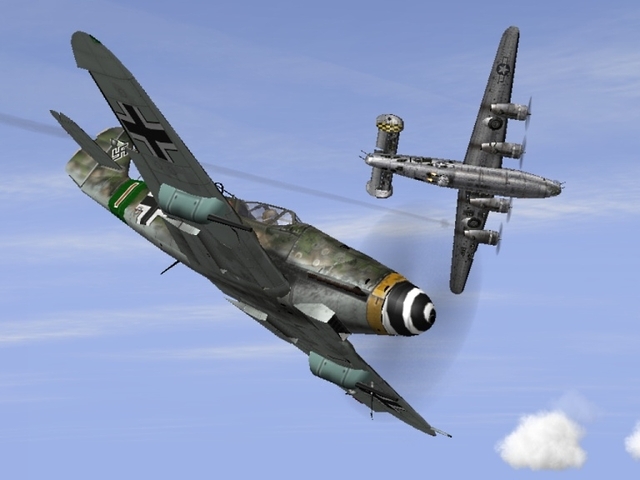 Without explanations, the Bf 109’s never closed in for the kill, the rounds never fired, and the Grim Reaper didn’t visit that spot in the sky that day. And desperately searching eyes were soon served up with the ultimate answer to the many earnest prayers…a landing strip out there in the distance. A pitifully small strip meant to cater to much smaller planes than this lumbering and wounded heavy bomber. But somehow in the dwindling light, none of that occurred and the plane and crew stopped short of the end of that abbreviated runway. And even better yet, they were miraculously greeted by friendly faces, and ushered to a somewhat cozy hangar to sleep in. A hangar perhaps like the one Ben and his crew found refuge after their near miss with death over Germany. Overnight, the expired engines were replaced, and patches were placed over assorted holes through the skin of the kindly spared and newly revived Liberator. Both craft and crew were warriors no doubt, but had more than a flock of guardian Angels keeping it all aloft and spared from a fateful end that day. After Ben was finished with his commitment to the war and duty in his gun turret, he made good his wartime promise to God. 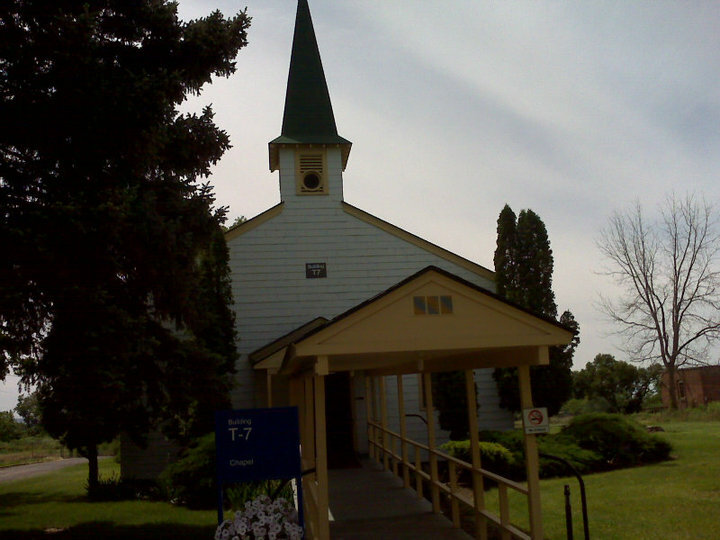 Ben attended Multnomah Bible College in Portland Oregon, where he met his future wife, Elizabeth, nicknamed “Betty”, and he graduated in 1949. The two of them were married and started a church in Astoria Oregon. Ben was a minister for about 20 years. Ben and Betty parented two sons, David and Peter, and eventually settled in Walla Walla, Washington. In the 1980’s, Ben heard a calling to focus some of his attentions on bettering the world of folks behind the Iron Curtain. After making blind donation shipments of bibles to Eastern bloc countries (Yugoslavia, Czechoslovakia, Hungary, and Poland), Ben was invited by the leader of the European Baptist Fellowship to tour behind the Iron Curtain as a guest minister there. Ben used his own funding and three week vacation periods to make a yearly journey there for the next eleven years. Ben has shared with me that the people behind that curtain tended to be desperately poor, and mostly had just each other and very meager means to stay alive. He also shared that they were the most faithful and inspiring people he had ever met. That they needed no specific denomination, no fancy building, or organization. He said simply, that their church consisted of people, their love for each other, and abiding faith. The spirit of those souls in light of such poverty still lifts him to this day. 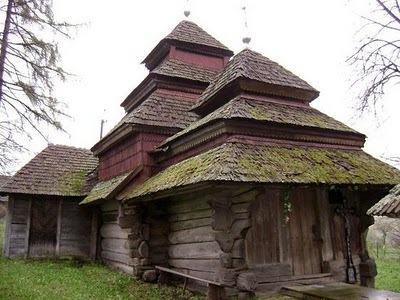 Example of a wooden church in Ukraine where Ben served as a guest Minister in the 1980’s. On a personal note; It is amazing to me how universal the statement made by too many souls around us that, “one person can’t make a difference”…Ben (and I) know that to be a falsehood and go about at least trying to affect a positive ripple in our daily efforts and projections regarding everyday life situations. One person can be very effective. People are seeking hope and the good in the world. One person can very much provide that light. I have been privileged to have had Ben share his opinions, his life experiences and efforts with me. His perspective is tempered by having been drawn into a world war and having had his youth interrupted, inconvenienced, and ultimately and ironically, had the course of his life positively focused by and because of that awful war. Because of his ongoing involvement with members of all branches of the various services, Ben did share an observation with me. He said that regardless of the era, those young combatants are from, that he can always identify a true warrior. That over the decades, the makeup and attitude of a true natural warrior doesn’t change. There are young men (and women now) that have the internal stuff that makes for a soul having what it takes to carry the battle to our enemies. Some folks are just meant for the stuff that wars are made of. He also understands that a true warrior might have issues with integrating back into everyday dealings here at home, and with being separated from their brothers and sisters in arms. There is an array of baggage that may and can accompany a service member home from the duty on the battlefield, assignment to a field hospital, and various other support roles near to the front. No matter what Ben shares with me, there is always an air of decisiveness, and an abundance of hard earned knowledge of the adversaries that good people face. He has a quiet determination and a long kindled proverbial “fire in his gut” regarding injustices and evil doings. I also have noted another trait I will call a great quality about Ben. In all our discussions over the years, he displays the most incredible dedication and passion in his every endeavor. Ben has a compassion for people in general, but especially for the fighters of wars. 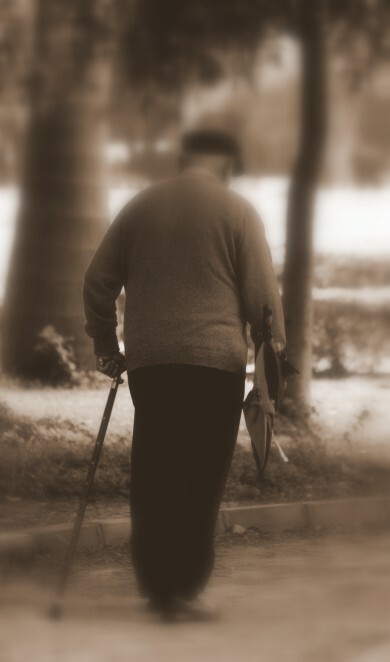 In reality, Ben is among a dwindling few remaining members of the greatest generation. I meet some of them in my town on a regular basis. I usually come to recognize them by the sighting of a baseball cap sharing their membership in a branch of a service involved in WWII. I will regularly stop that individual and thank him for his service and attempt to strike up at least a short conversation. These voices should be heard, and will soon all be silenced when they are called on to their rewards, and possibly to reunions with buddies lost in battle sixty some years ago. Most members of that war have until recently been tight lipped about what they did and witnessed in the course those awful years. Most moved on to civilian lives and never looked back at the interruption to their young lives. There has to be a prevailing pride and sadness that accompanies those having been a part of that war. Ben has never really turned away from that war nor those that followed. He has supported members fighting wars in our history, leading to the aggressions that are current today. He has had no reprieve, or break from the horrors of war in near to seventy years. He reflects sadly on a more recent trend of wars and warriors. The involvement of women in war zones in both support roles and combat positions. 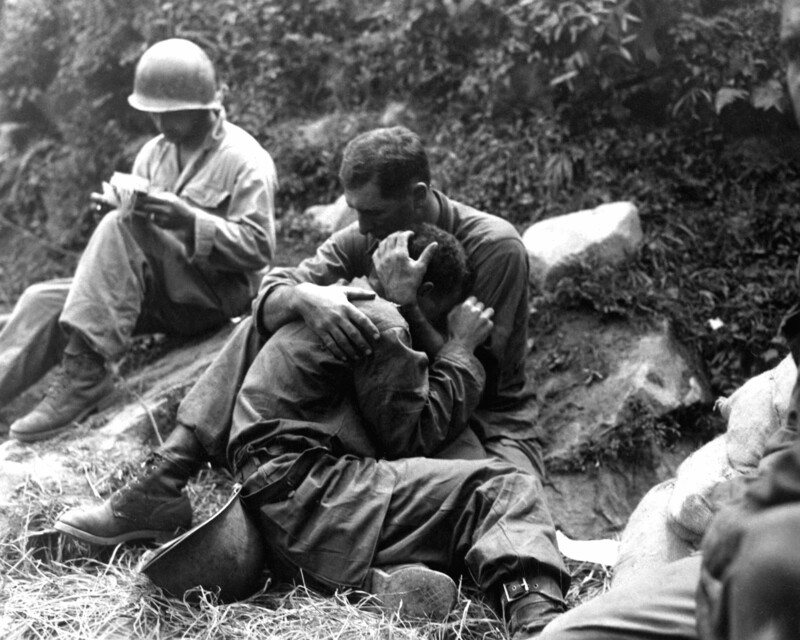 That war is hard on any individual is a given. But that war should be harder on the women members of various service branches who regularly become victims of assault of many kinds, at the hands of male members of their own units is a crying shame. The daughters and sisters and mothers of fellow citizens are suffering through despicable events and the consequential demands for silence and tolerance from the victims. This trend really angers and saddens Ben, as well it should. It is hard enough to add support to the members of returning members of combat units suffering with the residual effects of war in general terms. But chauvinism and sexual assault ought not to be among the causes of ill effects of our female volunteers. I too reflect the shame and disgust Ben feels regarding such matters. In my daily dealings and later regular visits with him, Ben always said the same thing at the close of an afternoon. “I have to get home to Betty. She needs me more every day”. 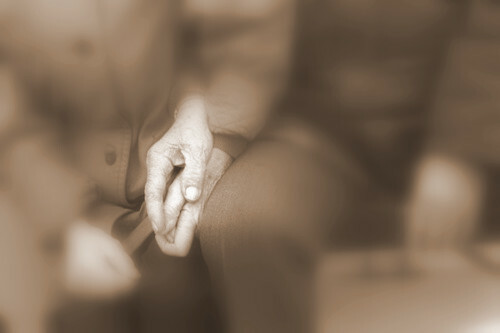 Late in 2010, Ben lost the love of his life, Betty, to a sudden illness. This was in addition to having lost of his son, David, 44, in 2003. Like my father, Ben had just one lady in his life. Each had but one girl, later to become his wife. My dad and mom were together for over fifty years, Ben and Betty for over sixty. These are good old fashioned men with the right to say they are still there for their women even after death did part them. After the loss of his wife, Ben stayed home from work for a few weeks to deal with the usual things that go along with such an event. 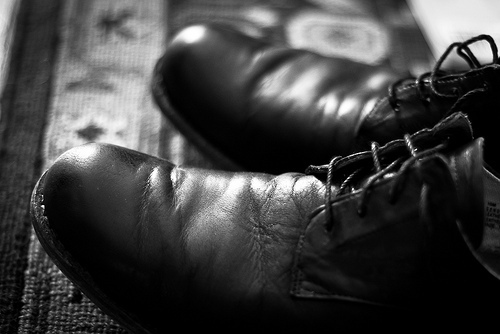 But he reflected after returning to the Chaplain position and his duties, that while being home, he had begun to lost lose track of time, of the days of the week (and I think perhaps a lack of purpose in life.) He knew he was needed back at the VA Hospital, and that should he choose to not return to work, that he would simply soon perish. Ben is still a popular guest speaker much in demand. His schedule is mostly full, and he still travels and drives on his own. His son Peter lives in Arizona, and receives visits from his father whenever Ben has the time to break away from work. Such a rare and remarkable man, my friend Ben. I wrote the following essay to honor Ben, and indirectly my father too. Both men will spend their twilight years without their late wives, and both appreciated the piece and reflected on the sentiments I penned. After sixty one years, the life that accompanied mine no longer shares the morning coffee, the news of the day. She no longer stirs the pot I momentarily forgot…fills the ice tray I left nearly empty. She is no longer the soul breathing quietly there on the pillow next to mine…nor a conversation long after the day has passed. I treasure every moment he chooses to share with me when I call him, or make my way to Walla Walla. I cling to his every word of advice, of his vivid recollections, and of him inviting me join him in spreading infectious optimism. I celebrate our friendship, and treasure his encouragement for me to continue writing and to find a larger and larger audience, so that I might make a difference in the word, as he has. I marvel at his nearly 90 years of honorable and rare dedication, but mostly I just love him as a treasured friend. And one more thought…When I do see Ben at the VA facility, I often walk with him to his appointed duties on my way to my car. Ben is nearly 90 and I am just 53, and I cannot keep up his walking pace without effort, even with my much longer legs. Ben has not slowed down over the past few years, so I expect he will be taking care of struggling veterans and looking forward to our visits for years to come. God Bless you Ben, and yes; that is a redundant thing I say. I gifted this writing to Ben, in honor of his 90th birthday on September 25, 2012. Matthew Lyle Landsman, September 2012. Recently, I visited a park on the Snake River about forty miles from my home. I went to the campground to visit old friends from my teens, when I lived in the country in the green side of Oregon. I descended on the lot of them just after dinner time, in the heat of an Eastern Washington evening in mid-August. After I located their campsites, I returned to the parking lot where I left my car and walked back to join the familiar array of vacationers…a spot about a quarter mile from the parking lot. It was a good visit with old friends…food and cool water to drink, a very pink sunset (thanks to wildfires in the desert)…and a campfire to visit around till it was nearly time the park gates were to close and lock; hastening my departure and another forty mile drive home under the stars. Normally I ride my motorcycle to the camp spot and can park it nearby, leaving me with a headlamp and a simple departure no matter the depth of desert darkness that accompanies zero effect from city lights and no surrounding homes. But on this night, without a flashlight or even a visible moon, I was left out in “country dark”. In other words, it was as dark as a night can be under clear skies with trees and wilderness as far as the eye can see. There was a narrow paved roadway I had walked in late evening light…with trees fringing the park and grass on either side of the modest roadway. That night there was no visible moon. Stars were partially hidden by trees. My feet and hands were not visible to my eyes. It was country dark. In that sort of darkness, I am aware the roadway still exists, that my hands still grace my wrists, and feet follow the ankles. That everything existing in the light still stands in the darkness. That fir and fawn will still be as they were at twilight, come the dawn. I recalled such country dark walks I took when I was first getting to know these high school friends in Oregon. I had to hold out my arm to know I wasn’t about to drift off into blackberry bush and brambles there at either side of the gravel road I trod back when…between the house of a neighbor and mine about a quarter of a mile apart. At night in rural western Oregon, one (still) finds country dark and a lot of gravel roads lined by tall timber and covered by a small dark sky. At the ages of fourteen and fifteen, a young guy is filled with bravado and a need to demonstrate bravery and an omniscient air. It is a rite of passage to set out into the night with keen young eyes, a steady stride, and a sense of purpose. Oh, I forgot, and bellbottom jeans wet up past the ankle. Country dark on a moonless night. A knowledge that what is there during the day will still be there at night. There is life that occurs after dark and is lit by artificial sources. But real life has to include an occasional trek without much more than memory and the senses. One can choose to remain indoors, safe and dry and assured. But some moments find us having to set out in times of need, of dire circumstances, of real life calling one to leave the safety and comfort of proverbial home. 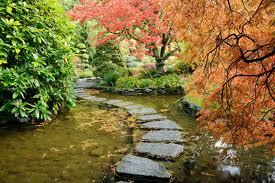 Sometimes we are asked to go where we haven’t, to walk on unbroken places with no paths, and too, over broken roads. In times of illness, of injury, of a soul in harm’s way. Asked to embark out into metaphoric country dark and answer to a selfless need and deed for the greater good. And we bring our own internal light, provided by courage, dedication, reflex, and a true need to do what is right. How does one explain such a rising to the occasion with no prior experience at such a calling? How do we justify setting out with no certain plan, no real end game, no idea what to do when we arrive. Life provides us with its own version of country dark. It is called parenthood, old age, adolescence, cancer, troubled pregnancy, war, and returning home afterwards. It is called a broken economy, a loss of self-respect, of the only certainty being the uncertainty we face. Country dark. One can only marvel at the ability for a young man or woman to volunteer into the various military services. Hoping to earn an education and a fair mortgage in return for service and sacrifice. Knowing well, but hoping against the nagging reality that down the road one can land in the midst of a mountainous or sandy desert country surrounded by souls who not only speak no English, or respect democracy, or in fact; life itself. And yet kids continue to enlist, train, sacrifice, deploy and face the possibility of a very long and perilous journey into a foreign country dark. Nights outdoors with light only from distant stars and muzzle flash, jet fighter afterburners, distant and not so distant artillery ordinance raining down death and destruction. All this with a promise of peril and later; possible lingering shadows that could remain even when one has returned home and left service behind. In essence, the past service draws one back to the darkness in dreams and waking hours too. Out of country, and in country-darkness. God bless those young people and their families. Back to my walk in the dark to my car…and a walk I made time and again nearly forty years ago. I used to be afraid of the dark, because of what I didn’t know. As a child, I was scared because of what I imagined could be in the darkness. In truth, I knew nothing for sure, other than that I was in fear. Over time, my fear of the dark, both actual and metaphoric, waned in tune with my growth as a person, my maturity level, my accumulation of facts over unfounded imaginings. I learned with experience, with self-assuredness and confidence. But the main reason a dwindling of the unknown took place, simply and honestly…was an accumulation of the teachings of time, of good explanations of unanswered and misunderstood questions and answers. Of a culmination and acceptance of mysteries and their burdens. The things taught to me by my various teachers: parents, my clergy, my knowing family and friends. My logic and intuition. In a word: Faith. In times and journeys in darkness, even without sight, there can be vision. Even without a prior time of having been in a certain place, either physically or spiritually, be it a time of ill health, or potential losses of love, of security, of emotional sanctuary, or of life itself…Even in the midst of a metaphoric country dark, there is a guiding hand should you extend yours and allow it to be taken. There is an inner compass steadied by simply believing you can navigate in an implacable darkness. Time and times spent in earnest seeking of the truth will point you to your true north. That light exists both inside, and in the sky. Even under gathering storm clouds and a mantle of tall timber, there is still that star, that truth, that light. An open heart depletes the cloak of things unseen. An open mind and good old faith brings uncertainty from the shadows, sheds disbelief from things unsure, and many other things that can’t be seen or touched, or heard, or explained. Faith has a way of lighting those things unknown and lost in country dark. It is light that clarifies depth, provides shadows and exposes a lack of depth, and brings dimension to things lacking in substance and unapparent worth. Faith can shed light on the truth, and also on the absence of truth. In country darkness, there can be a pure certainty in what you choose to believe with a lack of distractions. In full light, even though we want to believe with all certainty, there are always shadows, always places one can’t see behind or around. There can be deceptive places where depth is undefined. There can be false fronts, false securities, mirages, euphoria, and reflections beyond brilliant that dull the rest of things around us. In country dark, we are limited to what we know from memory, from intelligent deduction, and focus on the other senses. And a confidence in knowing and believing in what cannot be seen. In other words; faith. Even a young war combatant knows about faith. In fellow patriots, in training, faith in the knowledge of prayers from home, letters from home. A faith in oneself, and certainly; faith in God. 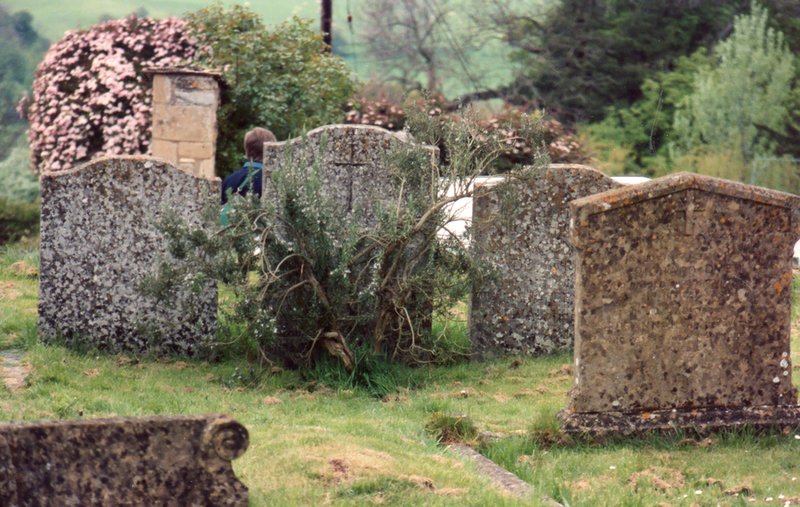 Even faith at the moment of mortality, that one hasn’t been abandoned. There can be darkness in the light of day, which can be lit and illuminated only by faith, pure and simple. Forty years after my first walks in country dark, I walk a similar path again. And after nearly fifty three years of living and learning, I am still somewhat afraid. I am cautious because of what I know is and isn’t out there in the dark, and yet I still journey. Still walk without a flashlight, and still arrive at my destination. I am still a bit leery of what I cannot see along an unlit path, still have no actual sense of navigations should I be somehow spun around. But I am wise enough to eventually find my bearings somehow, smart enough to stay put if need be till infant dawn, and considerate enough to know that my true north cannot be compromised by an easier path, and that faith has and will always bring me to know home again, even in the mist and midst of a country dark, the path will be clear. I have faith because of what I finally know, and what I am able to simply believe. Even in good old country dark, even today, there is a way…Faith. There are lines I draw, and lines I cross. Lines I keep, and lines I toss. Lines I follow and lines I send. Lines I embrace, and lines that vanish without a trace. Lines I borrow, and lines I lend. Lines I stand in, and lines I shun. from decades of smiles, laughs and cries. When two are joined; a receiving line. When one departs; a viewing line. Lines I remember, some I can’t recall. Lines we’re asked to walk, some we’re asked to talk. that come from distant jets after many good byes. and lines in the good book that help us decide the path to follow.